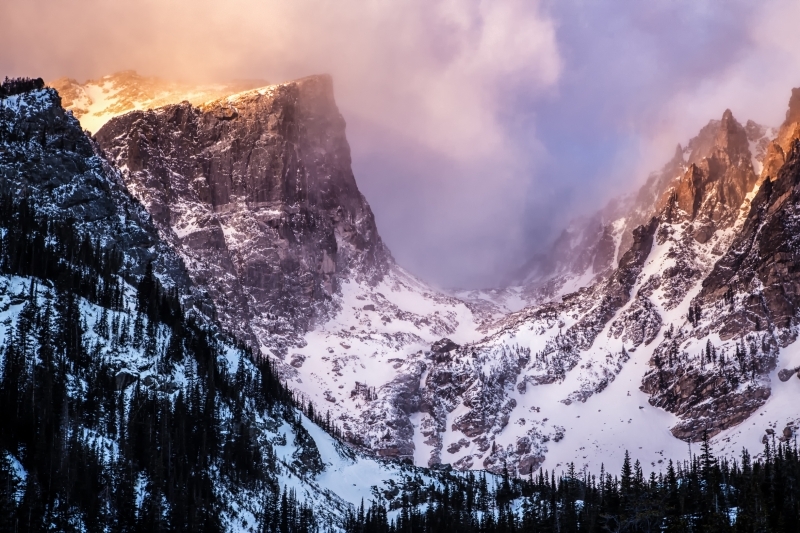 Taken at sunrise in Rocky Mountain National Park. I started up the trail about an hour before sunrise for the mile snow shoe hike to Dream Lake. It was an amazing sunrise on the frozen lake and as I was venturing back down the mountain, I was plagued with the dichotomy of wanting to return to the warmth and solace of the cabin versus turning around and seeing the landscape transform with the morning light dancing on the peaks in front of me. I kept peering back at this scene, longing to watch the transformation of the clouds and colors grazing the peaks. It's moments like this that draws me back to the mountains and awakens me out of my slumber.